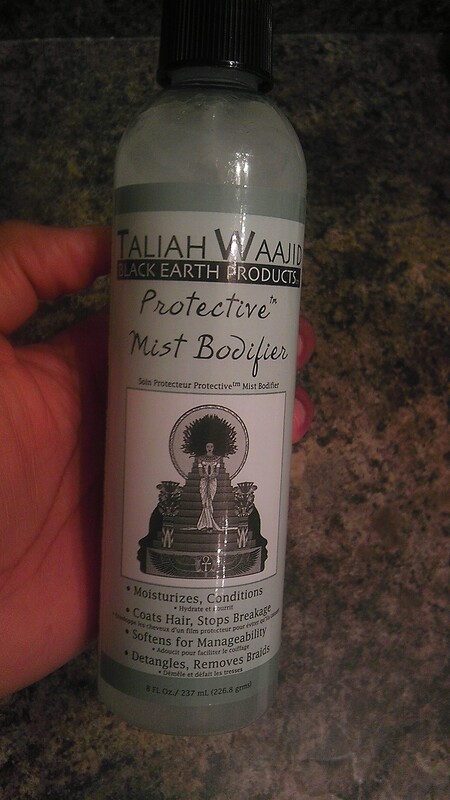 Taliah Waajid Black Earth Products now at Target. For all my Curly Girls & Natural hair followers. Look at what I found Friday night at Target for only $1.47! Taliah Waajid Black Earth Products . This is the Protective Mist Bodifier. Expect a full review very soon…maybe even as early as Saturday night. I was just saying today that I need to find another moisturizer for these frigid winter days. Currently I’m using Curls-Goddess Curls botanical gel(which is really light and gives me some curl definition) on top of my leave in and grapeseed oil, after my co-washes, but I think my hair needs something with a little more weight now. My tresses are super spongy, thick and require extra moisture during the fall/winter seasons. I’m hoping Black Earth will have the solution to my moisture needs. I really try hard to stick with hair products with minimal or no mineral oil, lots of natural botanicals, natural oils & pure natural butters. Normally, if I can’t find what Im looking for I’ll just make my own mix using butters, oils & my favorite leave in. I think because I’ve had to do that for so long, I’m getting worn out. I’ve been at this natural hair game since 96′ so if by 2013, I can’t find my perfect match, I think its time to seriously start looking into formulating my own hair products. I’ll let you know how this product performs on my hair asap. Until then…Stay Warm & Toasty!